These three levels in self mastery have taken many years to manifest on the Earth and a lot of energy has moved through my body while grounding them. I have been blessed to have worked with the Ascended Masters for the last 14 years channelling to groups and individuals. During this time I have channelled Master teachings live to groups once a week and we have created a library of teachings to assist humanity to come into the divine heart of Oneness. As the Keeper of Knowledge, Wisdom and Mystery teachings I have been guided by the Masters to bring many of these teachings together into a program to be offered to all who are called to open their hearts and become the master they are upon the Earth. The Masters' Way is a unique self-mastery program that is easy to use for all followers of the path of Mastery. It can be self-paced in home or you may be able to join a group in your local area with an accredited facilitator. Without the wonderful support and dedication of so many people I would not have been able to manifest these teachings for it was their hearts that opened the gateways for it to flow. To them I say, blessed be. The Master's Way self-mastery program comes in three levels - the Path of Light, the Path of Love and the Path of Mystery. The Path of Light teaches you to come into the power of your light to manifest your reality on the Earth. It teaches you about your light and how you have the power to create whatever you want to create in your life and how this may affect you. The Path of Love shows you how to connect with the divine and receive divine guidance, love and nourishment so you are fully supported to manifest your light on the Earth and truly ignite the Twin Flame within you. The Path of Mystery asks you to surrender to divine will and allow divine will to guide you completely in your life so that the Threefold Flame of God's heart may be activated within you as you walk on the Earth. This program can be done on your own as a self-initiated course or it can be done in a group with a teacher in your area. Check the Self Mastery in Your Area list for a teacher near you. We highly recommend you do this work in a group where you are supported to make such a big commitment to step into your self mastery. Each level comes with a student manual of approx. 340 pages that is well set out and simple to follow and access to MP3 audios for each lesson. All levels are now available in French. There is an introduction with all the information that you need to follow the course. 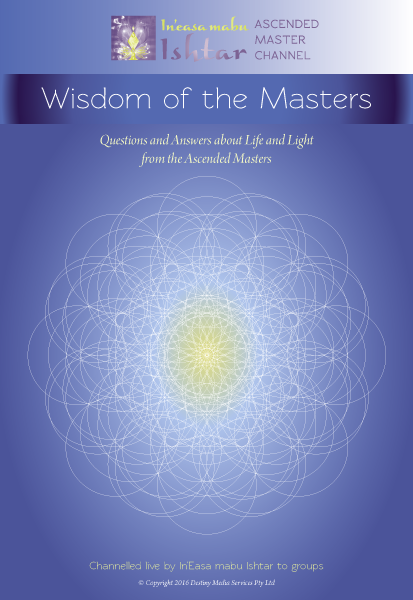 The Path of Light has 30 lessons with an audio channel direct from the Masters for you to listen to, which is supplied on an audio MP3 files. Each lesson also has a student workbook to follow and the manual includes a section called Tools of Assistance which has all the information, tools and knowledge you need to do the course, plus at the back of the manual you will find more than 30 questions and answers from the Masters to help you. Go to this link to see the content for The Path of Light. The Masters have shared with me that this self-mastery program assists all those who choose to walk the path of en-lightenment to open to the knowledge and wisdom of all that they are, to embrace unconditional love for all that is, and to manifest the power of the mystery of Source they hold within upon the Earth. Click here to see more about Levels 1 and 2. The second course we offer, which runs annually, is called Open to Channel. This is a high initiate course that guides the student to open their light pillar and anchor this on the Earth to channel streams of consciousness from their higher selves that are aligned to Divine Will and to manifest this in the highest way for them at this time. Each course is offered in partnership with the Ascended Masters and because I am an embodied channel the highest frequency of activation is encountered by all who choose to walk this path.